The London Aquatics Centre is a huge and beautifully built building situated in East London. It was where the 2012 Olympics Swimming and diving was held. Before you even step inside the building itself you are completely stunned. It is made to look like a giant wave and the walls are shiny glass. As soon as you step inside you can smell the chlorine and feel the amazing atmosphere of the massive building. It’s simply indescribable, the whole thing. How you’re in the same place as the world champions. Standing on the side in my blue swimming cozzie, I wondered how the Olympic contestants felt, when they were just about to dive off the highest diving board or about to start a swimming race. Were they as nervous as I would be? Or do they have some sort of immortal courage? 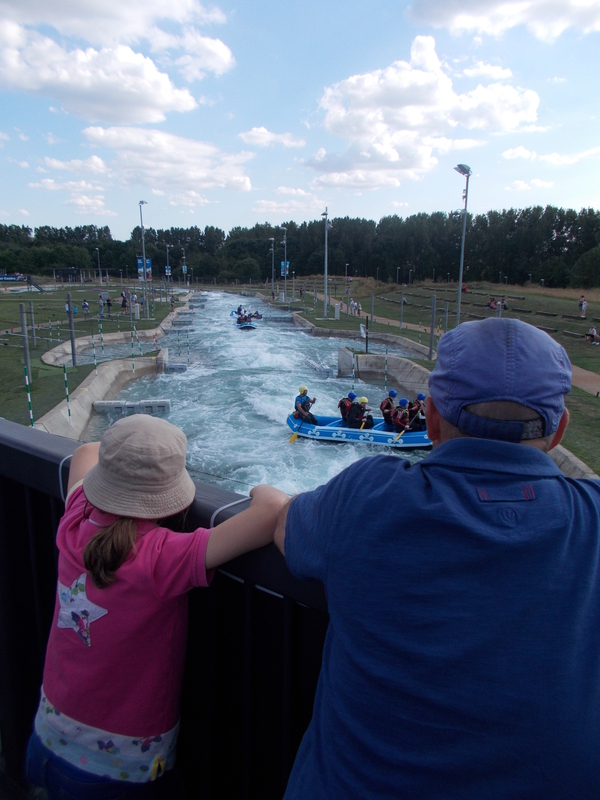 We were at the Olympic Pool for AquaSplash, a family friendly swimming session with a big inflatable assault course. There was also a lot of inflatable stepping stones that got more slippery as more wet feet jumped from one to the other, most falling on their bums and then sliding in. It required a great sense of balance to complete it. I did it 3 out of 4 times, pretty good, huh? The inflatable course was great too. We dived into the water and then scrabbled up onto the inflatable, then we clambered up obstacles and slid down the other side, usually bumping into the unsuspecting person in front of you. Then finally you skidded down the last, big slide into the water. I went down head first and it all went up my nose. It tingled and then came into my mouth, urrghhhh! I really really loved swimming in the London Aquatics Centre. It was just incredible and massively fun. We packed our rucksack with plastic tubs and everyone carried a bag, box or container of some kind. 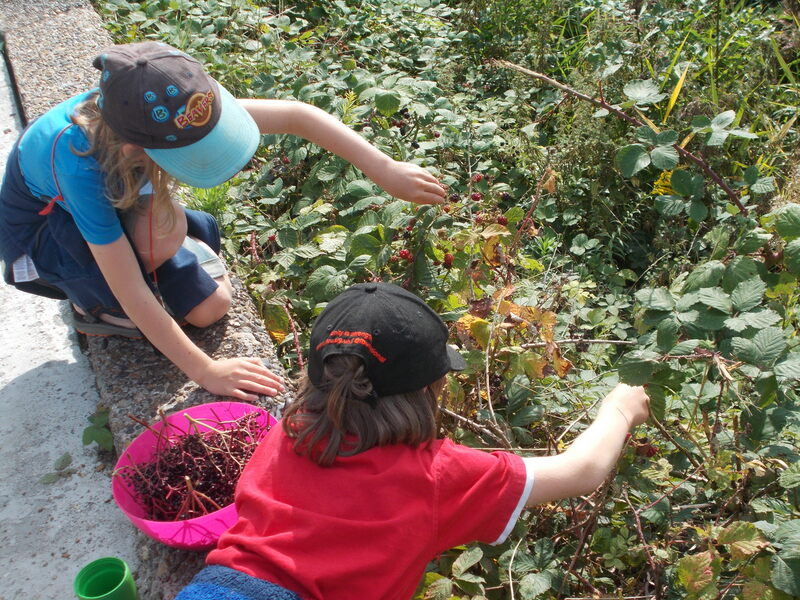 We were off to the Middlesex Filter Beds to harvest elderberries, blackberries and goldenrod for our Winter Tonic. Winter Tonic is a liquid that you drink daily during the winter period to prevent colds and ward off sickness bugs. It was a lovely summers day as we came to our first elder tree, a few bunches of shrivelled and green berries hung dejectedly at the top. We didn’t have much luck with the blackberries either. The only ones were mouldy or unripe. The wild fruits are scarce this year, but then we had some amazing crops last year. It makes my mouth water even to think about them. Victoria plums, juicy apples, delicious berries…….. Oh don’t! As we continued to search the nature reserve, we found many more elder trees. Most of which bared a small amount of ripe purple berries. The bramble bushes remained pretty fruitless, though. The one thing we found tons of was goldenrod. As were rooting around in one particularly bare blackberry bush, Irys spotted the tall, gangly, green stems and the bright yellow flowers of some goldenrod. We gathered some of the ‘rods’ for our tonic. We managed to scrape together just enough berries to make our Winter Tonic and we headed back to Loon to start the ‘making’ process. Whilst the others did that, I took my knife up to a nearby hedge to finish the ‘harvesting’ process. I met Dad who was on his way back from town and explained my mission to him. He showed me how to cut some strips of inner cherry bark. He said that I shouldn’t cut a ring of bark or else it’ll kill the tree. I gave the strips to Mum and she added them to our potion. In the morning mum said we were going to make our winter tonic, so we did. 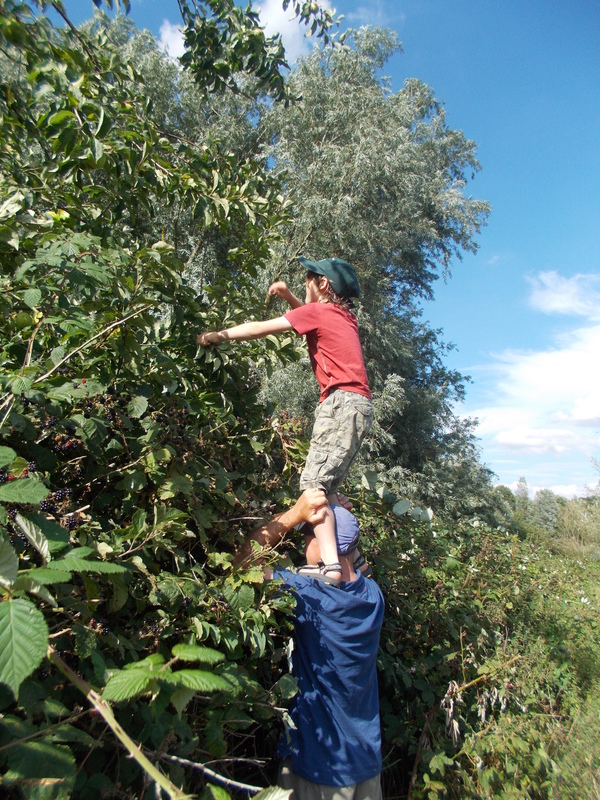 We packed a rucksack full of tubs and set off to the Filter Beds to get our blackberries and elderberries. Whilst we were doing so we saw a dog, it was a Briard, a french sheepdog. It was blonde and it reminded me of Minstral. The dog was called Maddy. She tried to lick me, it was the best part of my day, (other than swimming). 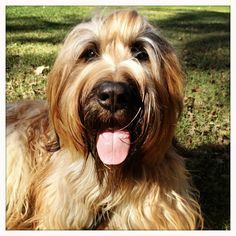 You can also get a fully black Briard. Maddy was in between a large dog and a medium dog. 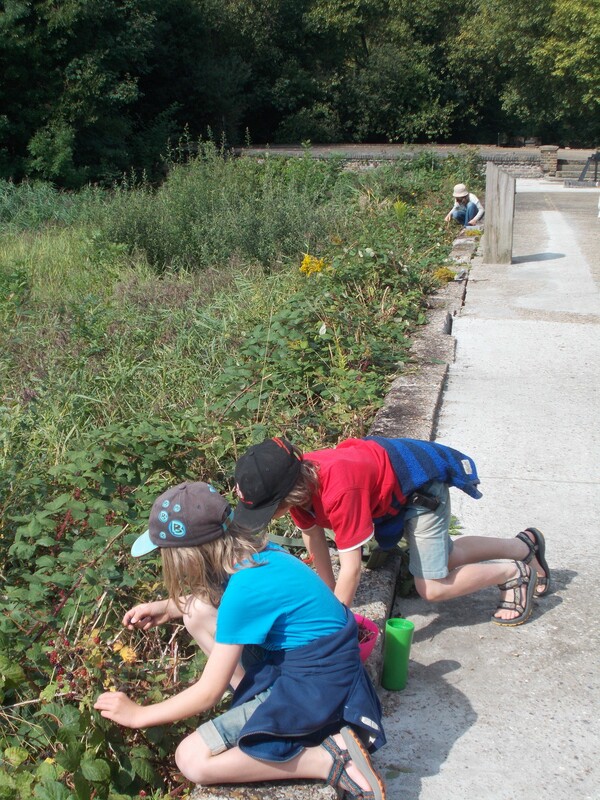 Whilst we were picking berries me and mum read a sign about how the filter beds worked and the reason they were there. In 1849 14,000 people died from cholera in East London. 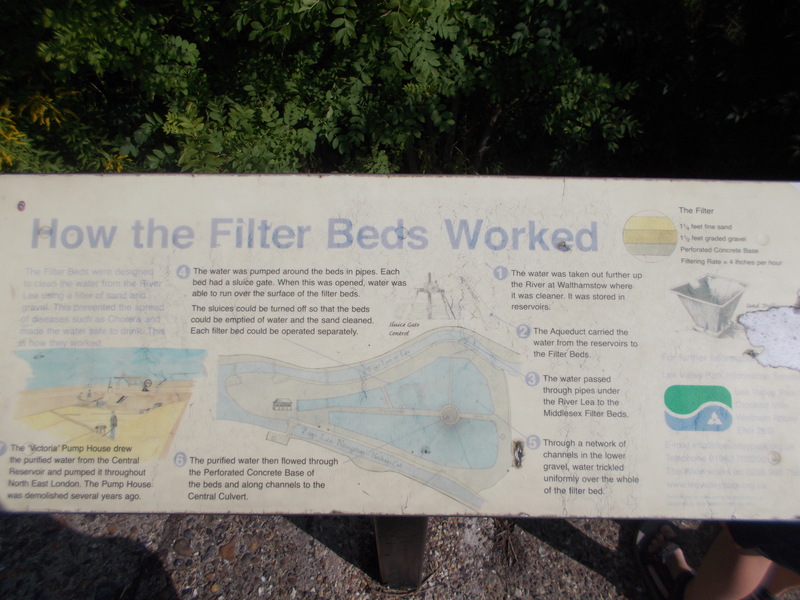 So in 1850 the filter beds were made to filter water from the River Lea so that North East London could drink clean water. 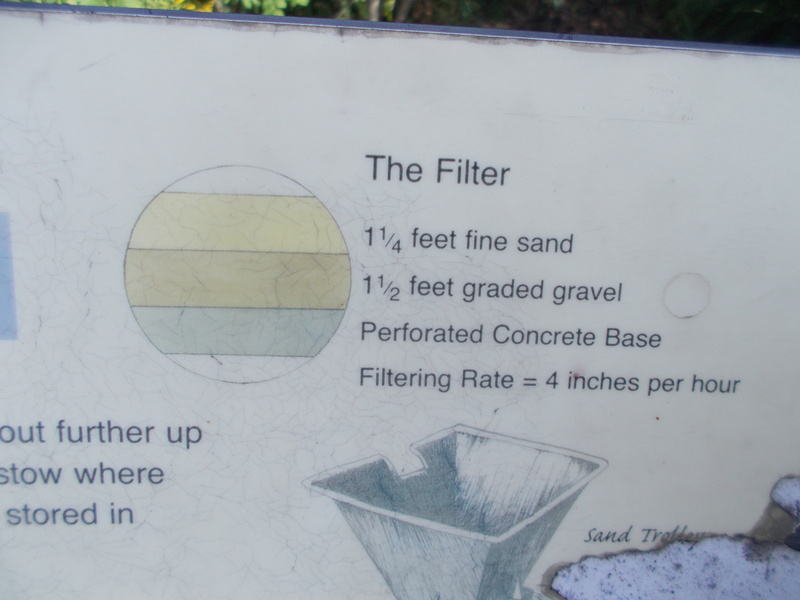 Water was filtered through sand and gravel. The beds were not filtering water all at the same time. It filtered 4 inches of water an hour. It is now a nature reserve. Today has been a great many things. Our morning was a struggle and a huge challenge to overcome. We very nearly gave up. But our afternoon was a complete contrast. After waiting two long, windy and rainy days at Tottenham, we finally pushed off. The reason we were so long was because it seemed everything was against us, the wind for one. Our vessel is so light she gets blown around like a lonely piece of confetti that goes swirling around the churchyard. also Mum’s done her back in, so she can’t pedal. So eventually, on Thursday early morn, when the wind had died down, Loon set sail once again. Dad and I were at the pedals when suddenly neither of us could make them go round. The weed was beginning to take its toll. We were totally clogged up and unable to move at all. Dad jumped off with a rope and I used my hands and feet to stop us bumping into other boats. Mum steered and Ev did the same as me, Irys tried to keep out of the way. Suddenly we all heard a low, but loud groaning noise. We all looked at each other with silent horror, ” We’re on the bottom”. We all realized at once and hurried to push the boat off, I grabbed the boathook and shoved it down into the depths in a desperate bid to get us out deeper. We did in the end, but Loon kept drifting into shallower water. Dad jumped in the water and paddled out to the boat, he tried to push Loon out, but the river pushed her into the shallows time and time again. 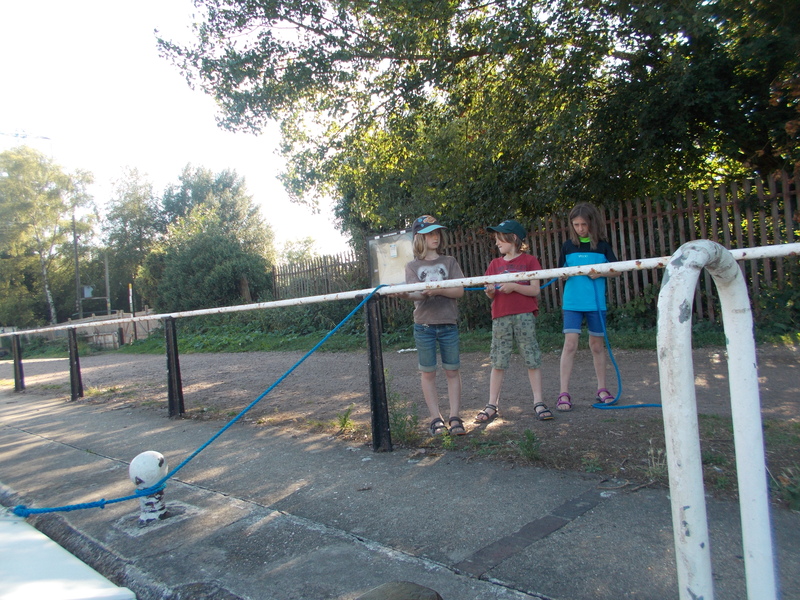 After many an hour of pushing, shoving, pulling ropes, steering and a little pedaling, we made it to Tottenham Lock. It just goes to show that if you put your mind to something, with a bit of determination, teamwork and hardiness, you can achieve it. “Phew!” we all said, as Dad and I were pedaling calmly through the weed free waters below the lock. Little did we know that another tolerance testing obstacle was just around the bend. That old familiar stiffness was starting to come over our pedal units as we got towards Springfield Marina. Dad stopped pedaling to unclog his unit and I had to pedal alone for about fifteen minutes. I was dragging clumps of weed and even a log at one point. It was extremely hard work. As we got nearer our destination, Hackney Wick, it got worse. No longer could I pedal and Dad could only just. We moored in the nearest place and I was ready to collapse. But then Dad said he wanted to check out how bad the weed was. This time we walked up the river for about a mile. Well, the weed is terrible all the way to the start of the Hertford Cut, which is where we’re going next. We’ll have to get a tow. Now we’re in town, The Town, The Big Town, London. As I said to Dad, even if you don’t like cities, like me ( I’m a country girl), you have to find something to admire about London. Whether it’s the brilliant and ingenious architecture or business and the colour. Once we got to Hackney Wick us three and Dad went for a walk down the canal. We saw a boat with a beaten up helicopter on the roof. I wanted to ask the owner of the helicopter if it worked but he was not there. After lunch we went for a walk up to the Olympic Park. This time the man was there and I asked him if it worked, he said, “it does,” and then he said, “would you like it?” “Oh yes” I said. He said that he found it drifting in the river. I am going to turn it into a spy plane with a camera on it. I was so excited about it, I was running around with it in my hand pretending it was flying. 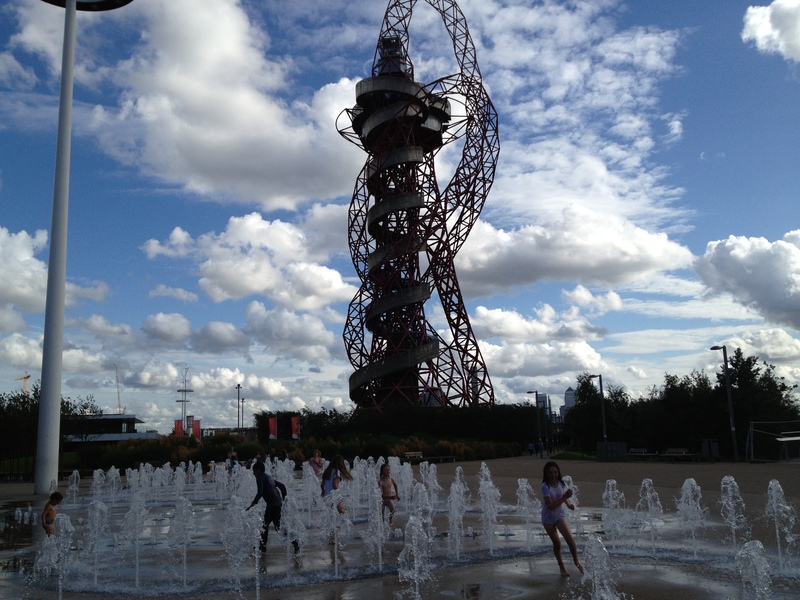 We were in the Olympic Park and we saw some fountains, they were special because they glinted in the sun. They were tall and thin and shot out of the ground. 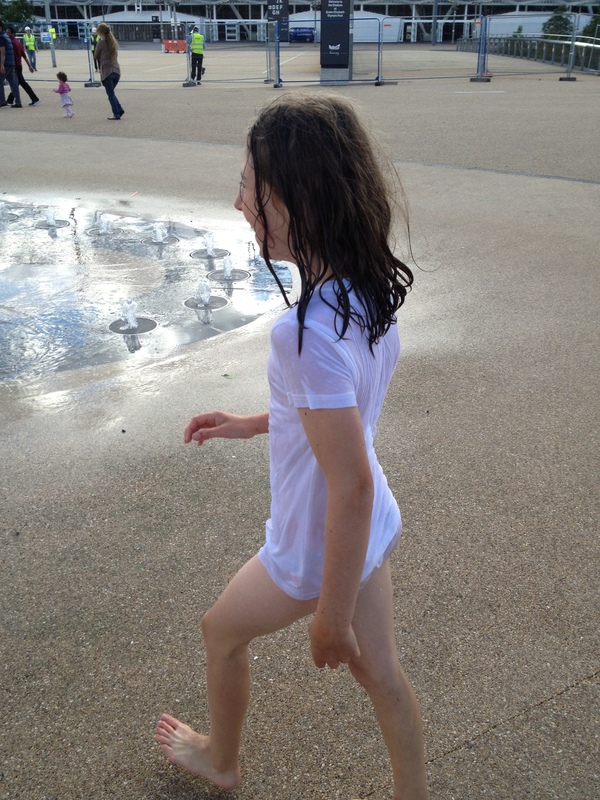 We stripped down till we were in our underwear and then we ran into the fountains. I loved the way the water splashed in my face and also went up my nose and in my ear, it was so funny. In the end I got cold so I decided to go and put my clothes on and then we headed home. This afternoon we visited the Queen Elizabeth Olympic Park. The best part was the fountains. They looked so appealing and I longed to feel their cool splash on my face. The water giggles and burbles with the youths. The sun smiles down on them all. The children run in and out , oblivious to the world. Cries of pure joy echo around the courtyard. Long wet hair whips in the wind. Shouts of hooray, on a warm summer’s day. Of the Group of children that went in at the same time as us, I was the last one out. I was alone in what I imagined as my own water kingdom. I was the queen, so I pranced around like one, skipping and splashin’. I was in my element. 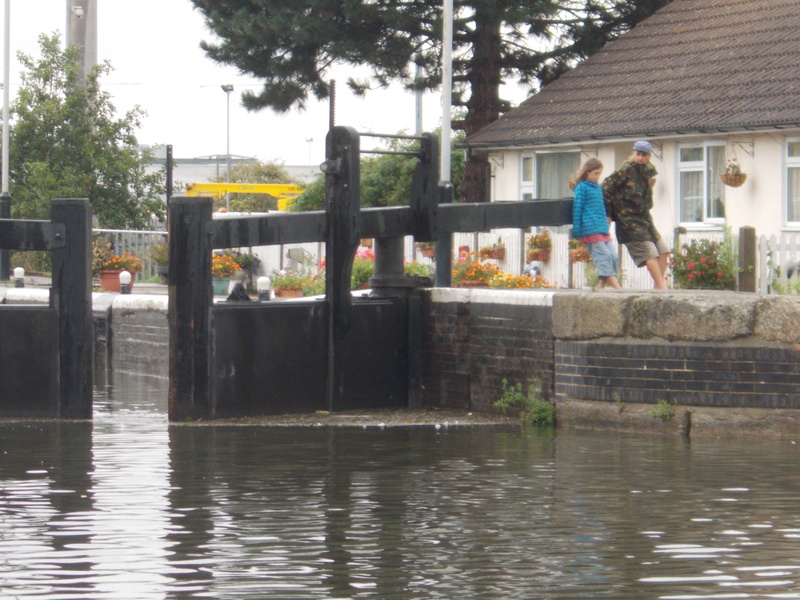 The first but only lock we did today was Stonebridge Lock. 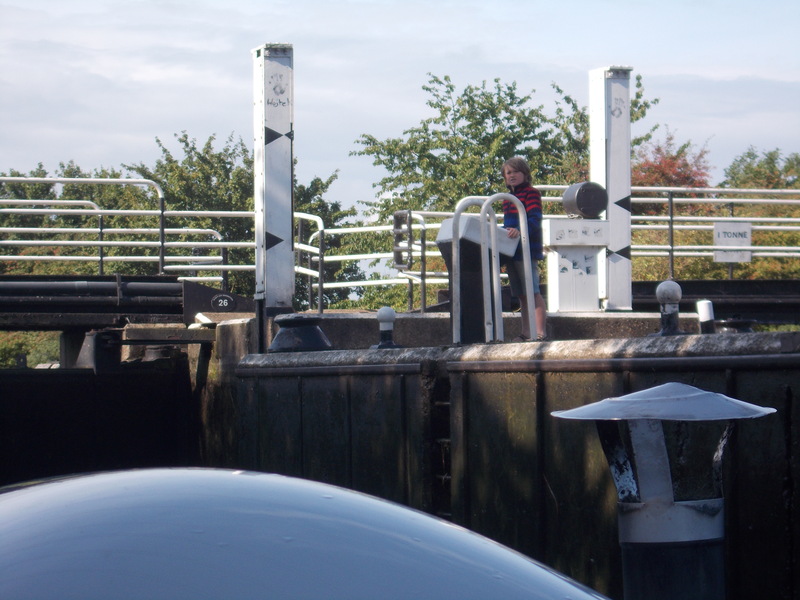 Stonebridge Lock is fully automatic. 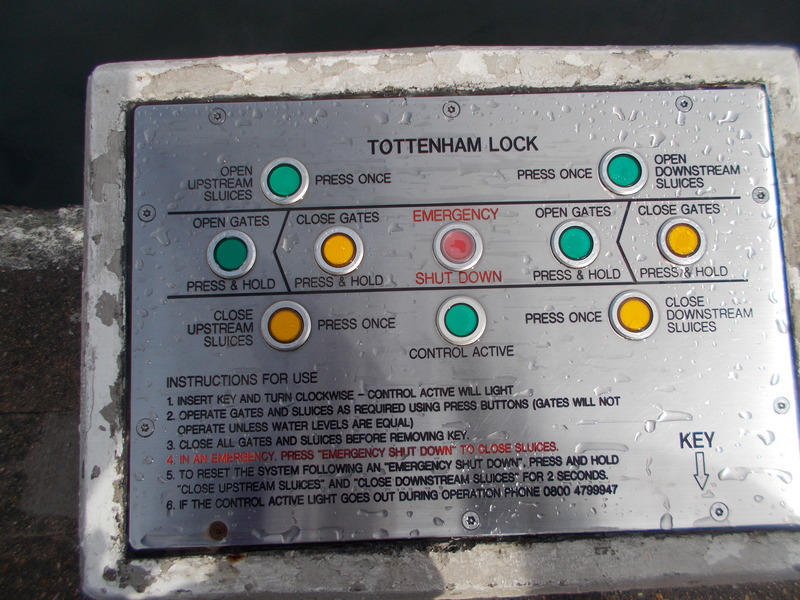 Once we got to the lock we moored the boat up and me and dad walked over to the control panel. We got our lock key and put it in the hole in the control panel and turned it, the panel lit up. I pressed the button which said ‘close downstream gates’. 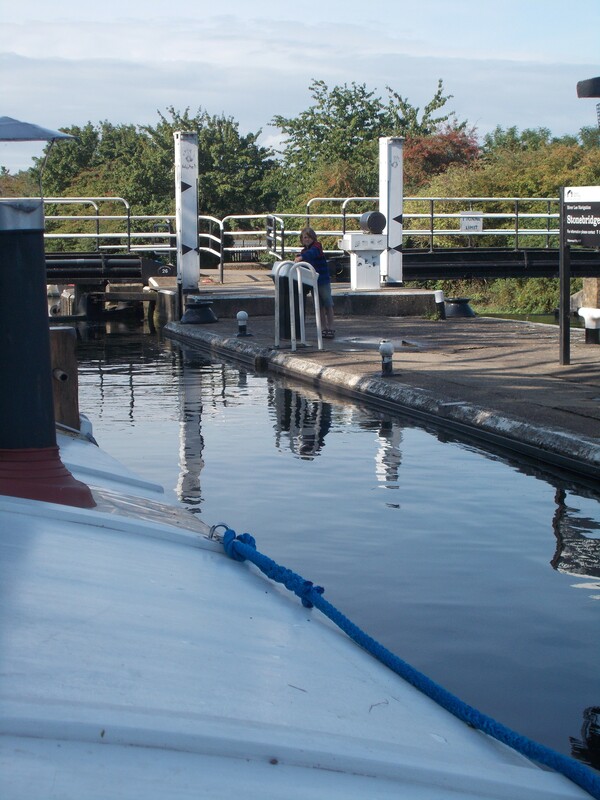 I then pressed ‘open upstream sluice’ and we waited for the lock to fill. The sluice gates open a little at a time. 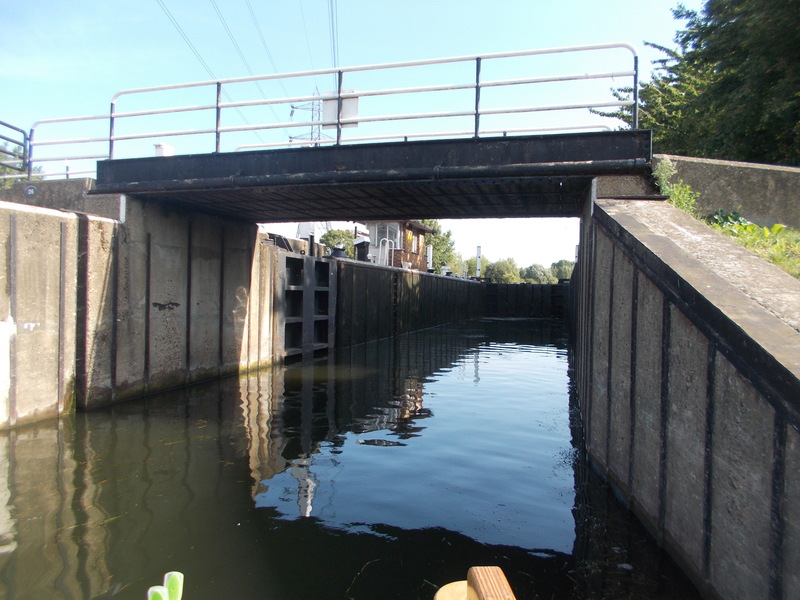 Once the lock was filled I opened the upstream gates and mum pedaled in. I then shut the gates behind Loon. 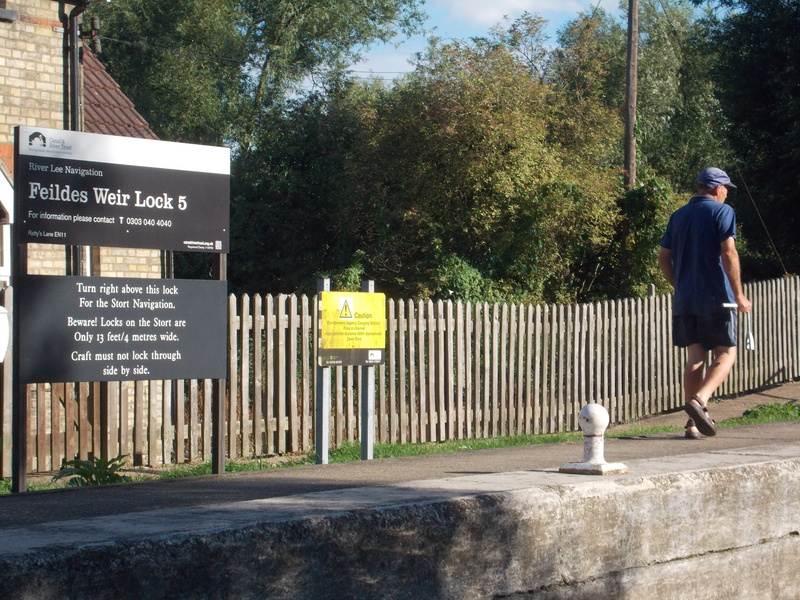 Dad was on the other side of the lock holding the rope and chatting to a man. Once the gates were shut I opened the ‘downstream sluice’. It took about ten minutes for it to empty. Once it was empty I opened the downstream gates, took the key out and we were off. The gates and sluices open and close by hydraulic rams. In the morning we set off to Hackney Wick but we didn’t get that far because the wind was blowing really hard from the south at 17 mph. Mum and Dad could hardly move us along. Evan helped dad with Stonebridge Lock. It was electric so he got to use all the different buttons. It was made an automatic lock in 2015. The lock was really deep. We had a walk down to the next lock, on our way we saw two big replicas of Powder Barges, they both had massive masts. 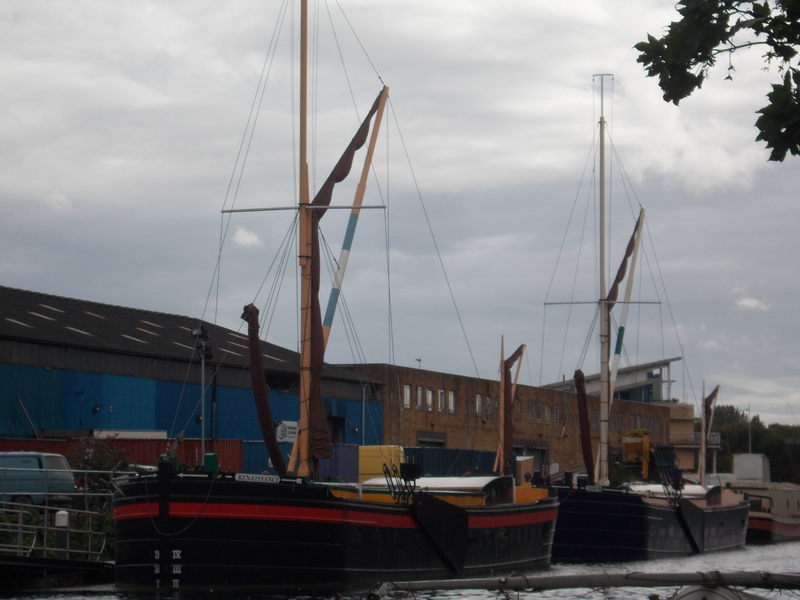 Renaissance and Judith are the names of the boats. From 1816 Powder boats were used for carrying gun powder from Waltham Abbey to Woolwich, it was the safest way to carry gun powder. 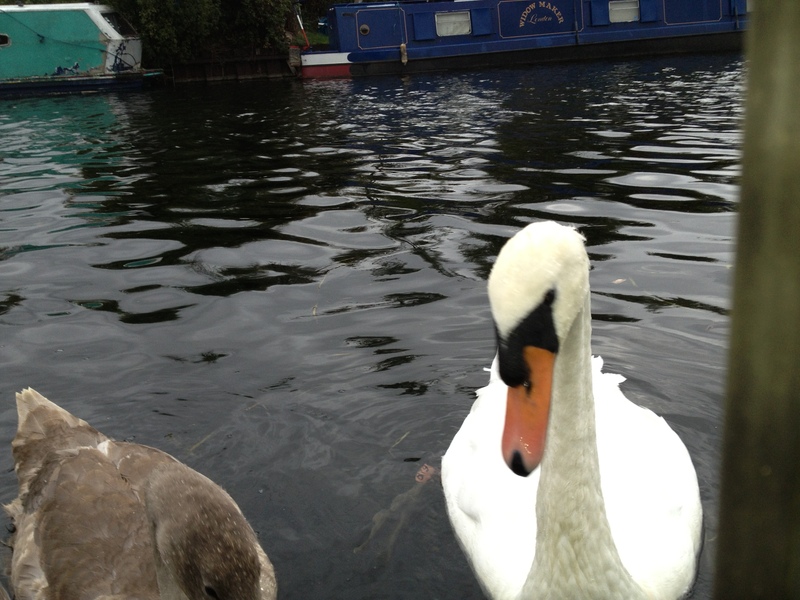 We are currently moored near Tottenham Lock. There are a pair of swans here with an unusually large family. 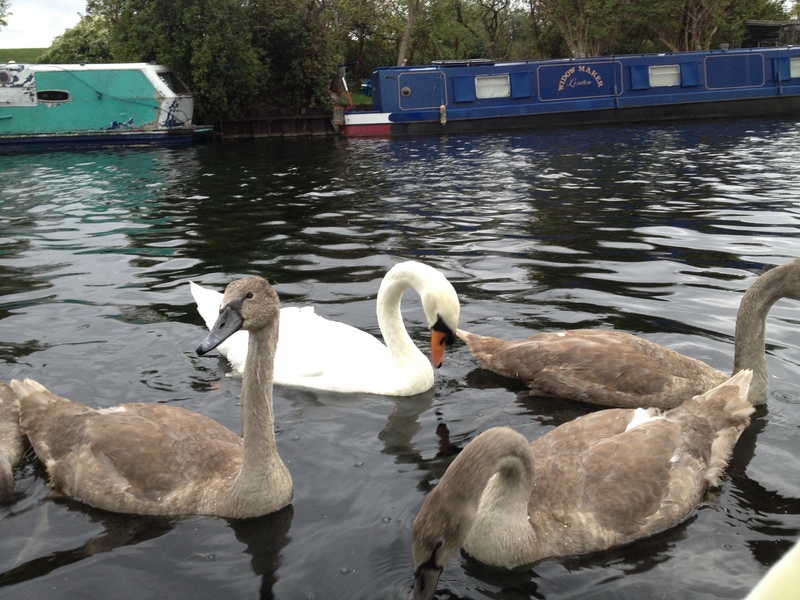 They have eight cygnets! This seems to be their territory. This morning they came round to the window, all of them, wanting to be fed. It was pretty special. I’d never seen a swan so close. Being such a keen birder, I thoroughly enjoyed the experience. You notice a lot about swan behaviour seeing them so close up. Swans seemed to me like good parents because as we threw the bread out of the window, I observed that the adults hung back and let the young ones feed. They didn’t rush in and gobble it all up, though they easily could have done. 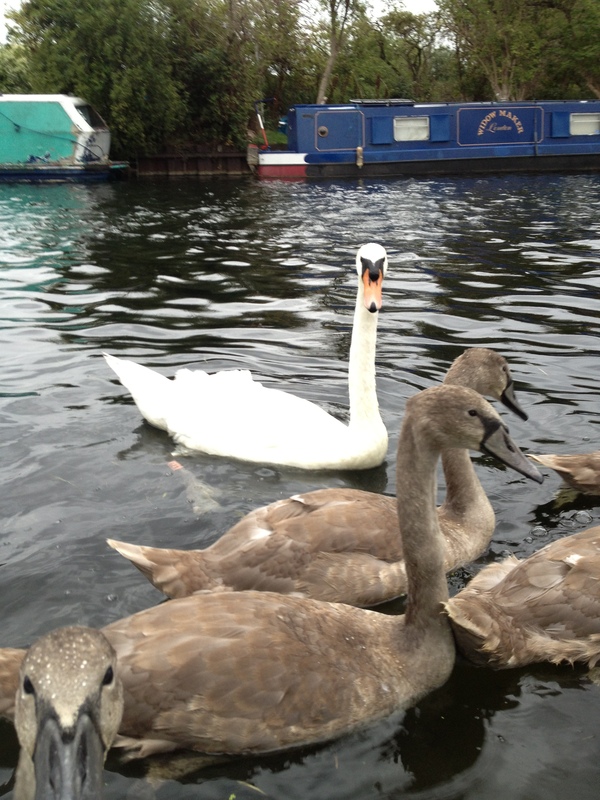 Mute swans are a common sight in Britain’s and some of Europe’s lakes, rivers, canals and waterways all year round. Some people go looking for exotic and rare birds and they just take the ones they see everyday for granted. These birds have so much beauty and so many interesting features, if you can only see through their familiarity. Mute swans are so royal. I always think of them as the kings and queens of the water birds. The way they keep their heads held high and appear so proud. How they glide effortlessly through the water. How a mother keeps her cygnets in a perfect line behind her. The female is always so elegant and the male so majestic. Now to the real facts about mute swans. Here goes my guide. Mute Swans are pure white, their feathers are large. I often wonder how they manage to stay so clean whilst swimming on such dirty waters. I guess it’s because they preen themselves so regularly. Their bills are a dark orange with a black basal knob. The male (cob) has a larger one than the female (pen). 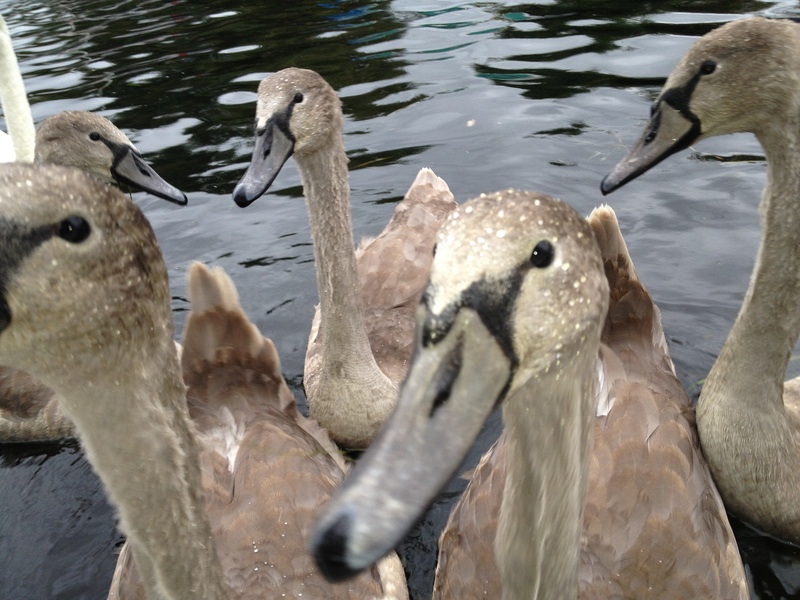 The young are called cygnets and have a tan/grey downy plumage and a grey beak. They lack the basal knob. Mute swans are not actually mute, they make hissing noises on defence and honks in their courtship dance. They also make a very distinctive sound when they fly, but surprisingly it doesn’t come out of their beak. It is the beating of their wings. They eat submerged plants and weeds. Nests on the ground, usually on banks or islands. On average they lay 5-7 eggs. They mate for life so the male sticks around to help rear the young. The Latin name for a mute swan is Cygnus Olor. 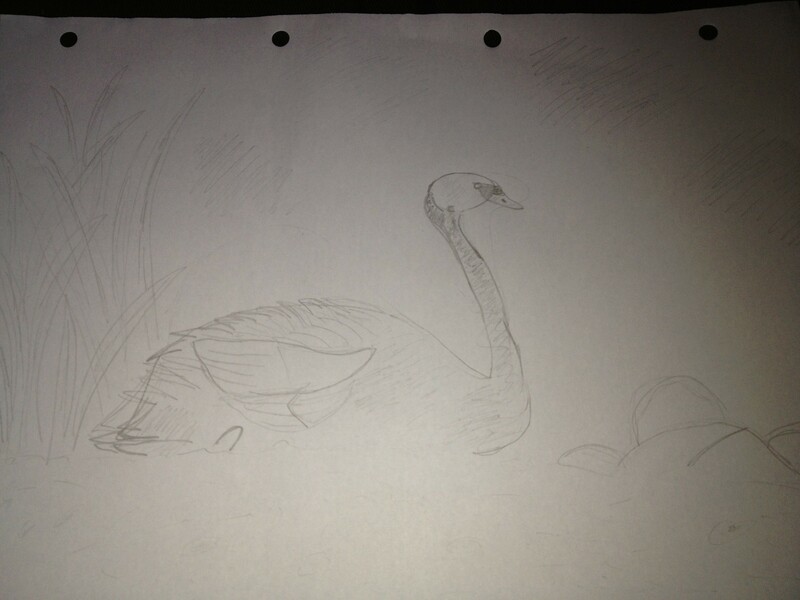 It is a myth that swans only sing when they are dying. There are lots of different types of swan, including Bewick’s swans (Cygnus Columbianus) and Whooper Swan (Cygnus Cygnus). 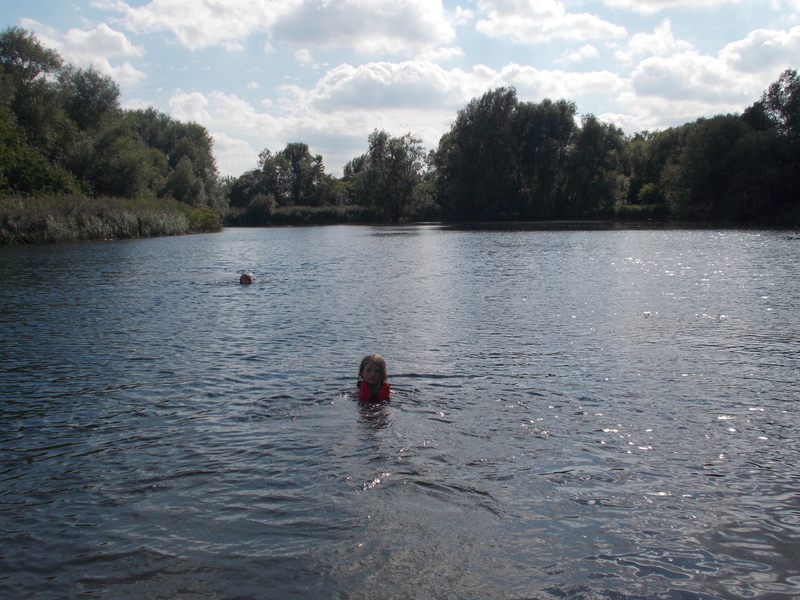 A little note – We travelled from Waltham Abbey to Tottenham and covered about eight miles. In total we did four locks. Today I learnt how to steer our boat. It was pouring with rain so I decided to give Mum a break. Mum went down below, she’d worked hard, I took her place on the saddle. The umbrella dripped, plip, plop, plip, plop, onto us, but we didn’t give up. We battled on like lone soldiers, whatever the weather. Then Dad let me steer for a bit. He told me that I must keep the rudder straight, which makes us go right down the middle of the river. The actual steering was quite tricky, because if you pulled the tiller right the boat went left and if you pulled the tiller left the boat went right. I had to be really careful not to hit any logs or rocks that were half submerged in water. An encounter with one of those things would be lethal. It would scratch the paint off and then the wood would be exposed to the water. Then the wood would rot and there’d be a hole in Loon. To put it simply, we’d sink. After a while Dad allowed me to pedal alone, whilst steering. It took me a moment to actually realise that it was me making the us go along and me who was in control of the boat. I felt quite proud even though Mum and Dad do it everyday. I should like to steer again during our journey. 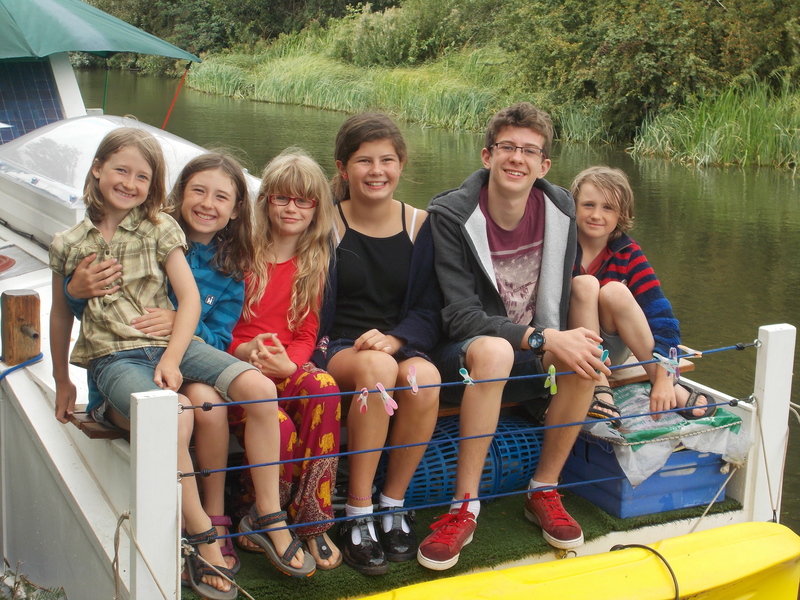 Our boat, Loon, is called an Escargot, but you can get a bigger version designed by the same man, Philip Thiel. It’s called a Joli, is larger and also has a motor. Early this morning, milk was needed for breakfast. So Dad and I walked into Waltham Abbey town. I read the sign on the way in: Waltham Abbey, Last resting place of Harold II. Harold was first called Harold Godwinson, but then he became King Of England and so became Harold II. He fought against William the conqueror in the battle of Hastings in 1066. Tragically, he was slain in battle and is buried at Waltham Abbey. My Dad knows Waltham Abbey well, he lived there, his brother lived there. So I learnt about my Dad’s history too, not just Harold the Second’s. I suppose my Dad’s history is my history as well. I found it all very interesting. 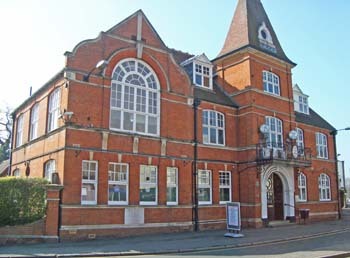 Dad showed me the village hall where he and mum first met, all the pubs he used to go in, the Pie and Mash shop where he used to get stewed eels and all the different streets. Dad told me about when he used to build sets for the amateur dramatics group and how, on the Saturday shows, it was the tradition to play silly jokes on the other members of the group. Dad played a really funny prank on his friend. Well, they were doing the show of Oklahoma! and Dad’s friend was the main character, Curly. The guy had to climb over this fence whilst singing a song, but Dad raised the fence so he couldn’t get over. He had to scramble over this fence, still singing and not let the audience realise what was happening. Dad also played another trick. In this scene, the man walked into this house singing a very dramatic, sad song. Then he was supposed to look at this photo on the wall, but Dad swapped it for a picture of his friend’s first girlfriend. When Dad told me these funny memories, we both exploded into laughter. We also met a man and his wife on the boat next to ours. They lived on this really nice boat, that I particularly liked. It was built in 1920, so it’s nearly 100 years old. 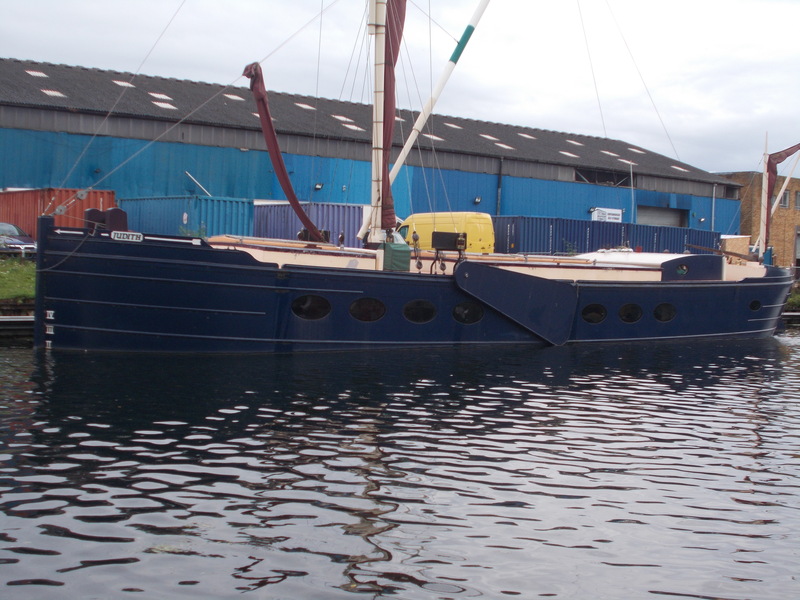 It’s called a Westlander Dutch Barge and was used to transport cows to different places. I was surprised at its age because it looked quite modern. It was very unusual. At 2 o’clock our cousins came to see us and we watched he white water rafting. It was funny because all of us wanted people to fall out of the boats and be saved. If they did fall out we cheered. At the end of the day the Bognor Hillbillies, as we call them, had a go at pedaling our boat. Dad was so surprised that Dot could pedal, Freddy and Flossie could steer. Us kids cheered because we wanted to stay together for longer. When I was sitting with Dot she said to me we should buy a boat and sail together round the canals. Just before dinner a man called Barry, who was moored next to us, showed me and Dad some old wood that he got for free at a timber yard. He was going to use it for the floor of his wheelhouse. He also showed us his split cane fishing rod and his three-piece fishing rod. Barry said that he prefers the gear instead of fishing. 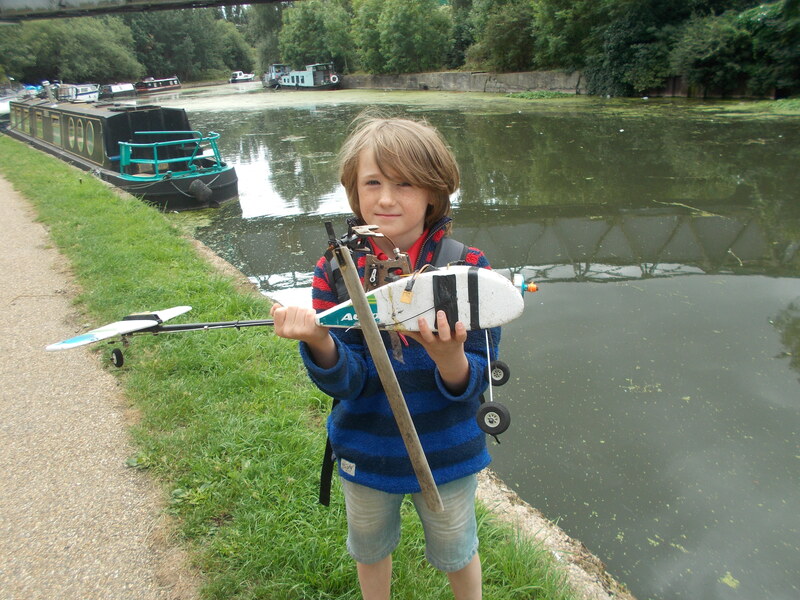 Today we travelled from Dobs Weir to Waltham Abbey, went through 6 locks and had many adventures on the way. 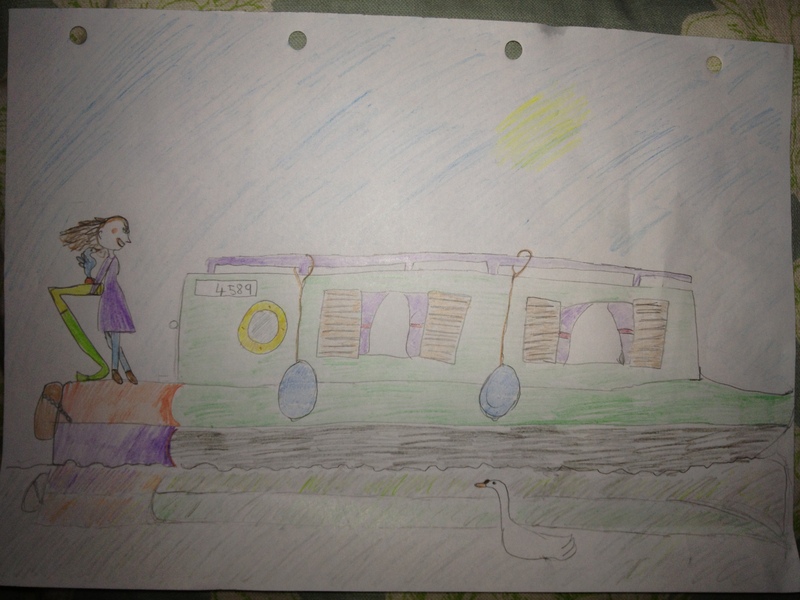 This is Irys’ depiction of the boats experience of one of the locks we did. 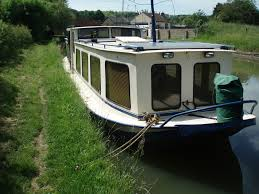 I got so excited when Jem and Dave moored me up in the queue for the lock. It was a bit strange going in with two other boats, but I thoroughly enjoyed it you know. I like it when the three kids pay attention when holding my rope. It’s fun going down in the lock. The sluice gates open and I wobble to either side. As I come out at least I don’t have to stop when I’m picking my crew up as they grab hold of the post at the bow and jump on. 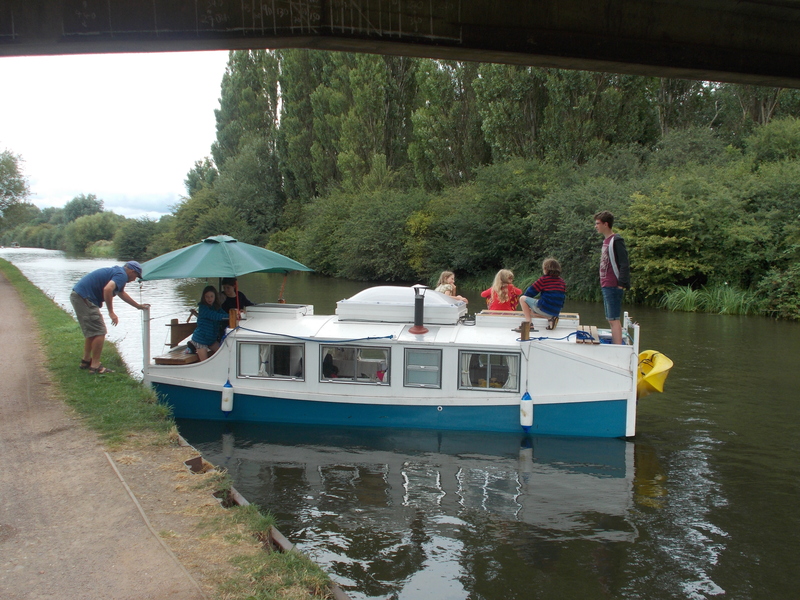 If you’re ever a cyclist, walker or boater anywhere near Cheshunt Lock, be sure to stop at Ice Dreamz ice cream boat. It’s run by a super friendly team and led by this very nice, very enthusiastic young man. He saw a need for ice cream on the river so he got off his backside and made himself a business out of it. 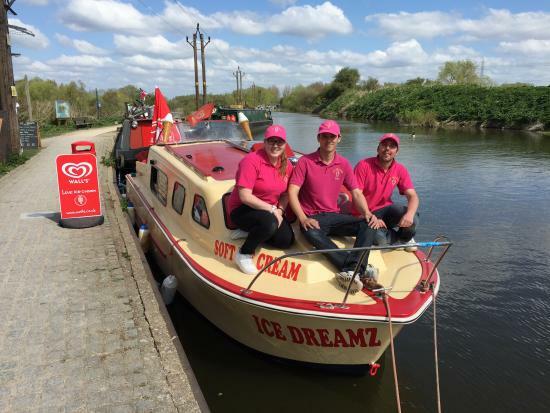 He bought a boat, did it up, got a licence and is now the only ice cream boat, selling soft ice cream, in the UK! Ice Dreamz sell all sorts of things besides ice cream, such as burgers, hotdogs, wraps, crisps, tea, coffee and chocolate bars. It has something for everyone. There is carpark nearby and a seating area, so it is suitable for the disabled and the elderly. There are two very lovable puppies, who always want to be petted hanging around. The team is always ready to chat and hang out with their customers, who are quite varied. From a full-time boater to a retired couple on a relaxing holiday and from a Lycra clad cyclist to a family on an afternoon stroll. I think everyone will enjoy something about this lovely little setup. I like the originality of Ice Dreamz. 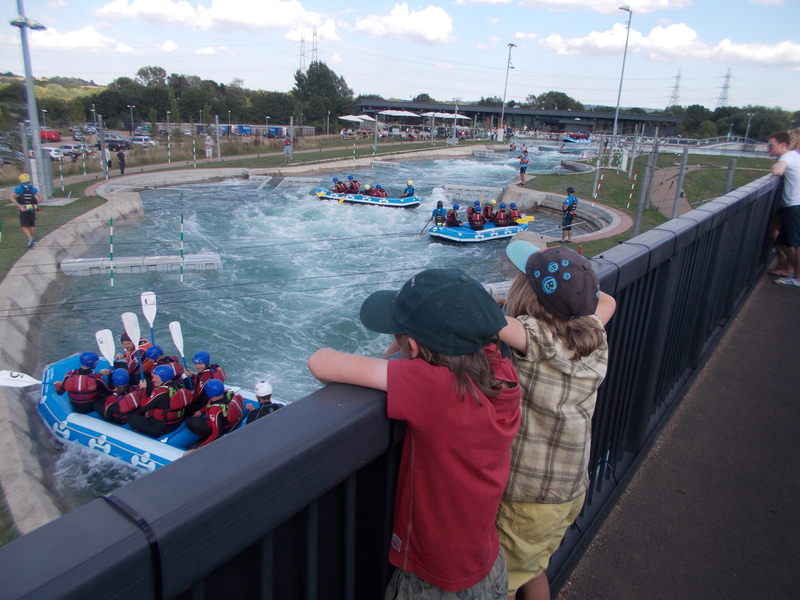 We went to the White Water Rafting Centre in Waltham Abbey. We were standing on a bridge over the water watching the boats coming down, suddenly one of the rafts capsized and the crew were all in the raging water. They were getting swept down and their bodies were going under the water. The lifeguards started running down the banks after them throwing bouyant safety lines in and hauling them out. One of the instructors ran and dived into the white water to rescue someone who was getting pulled down with the current. Another lifeguard ran underneath the steps of the bridge, dived in and saved the boat. There were no injuries, everyone was fine. They then went back to the start, hopped in the boat and went back round the course again. We set off from Stanstead Abbots at about 10am and pedaled to Glen Faba. We met our friends by a lake. Our friends are called Dan, Emma, Pep and Nena. Me and Irys played Lego with Pep while Gracie swam in the lake. Later, Irys and I swam too. 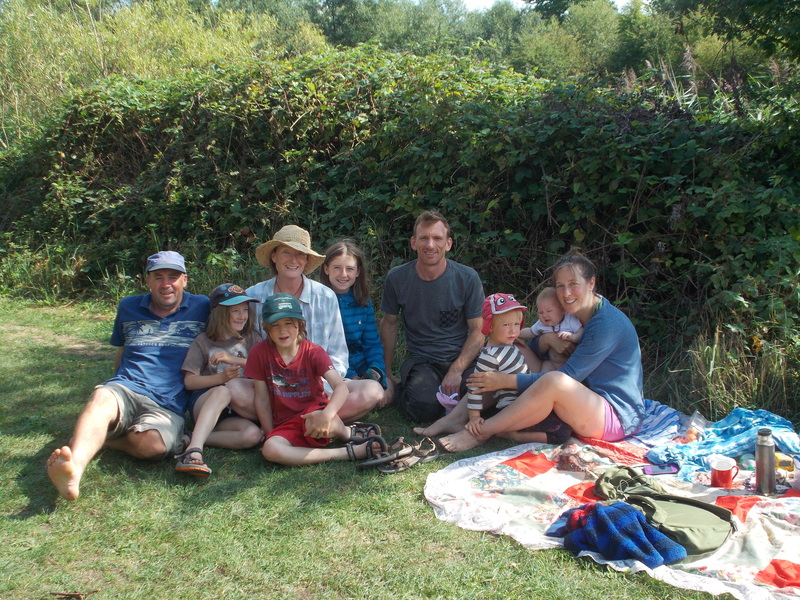 From Left- Dad, Irys, Evan, Mum, Me, Dan, Pep, baby Nena and Emma. Dan said there were no plums on the trees this year, I was disappointed, but we got to swim. It was so fun. We got some apples and blackberries for our crumble. Mum always said I was a water baby and I reckon it’s true. 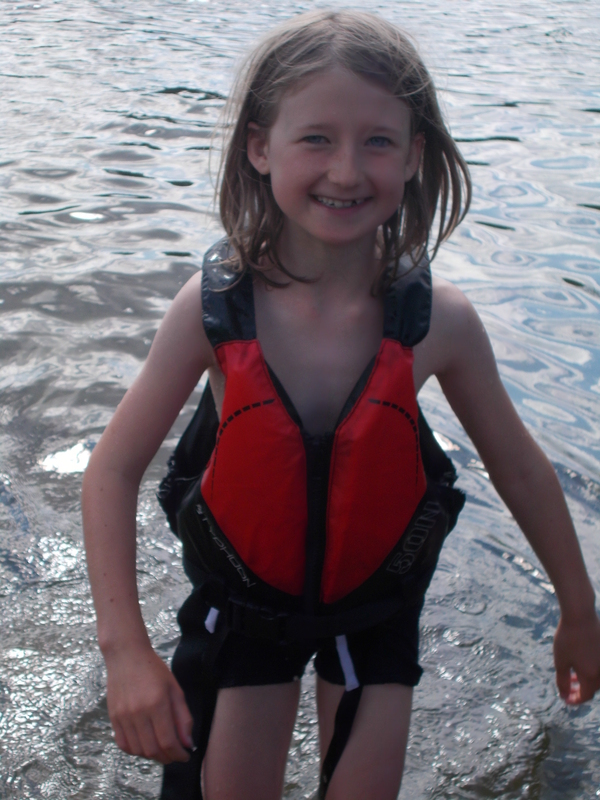 I love water and swimming, that’s why I really enjoyed swimming in the lake. It was peaceful and calm, the sun was shimmering on the rippling surface and I just glided through the water. The feeling of absolute freedom was beautiful, it felt so serene. The tranquility was lovely. For these last few days we have been staying at our grannys whilst we got ready to go on the boat. Today I got up so excited because we are going to launch our boat. 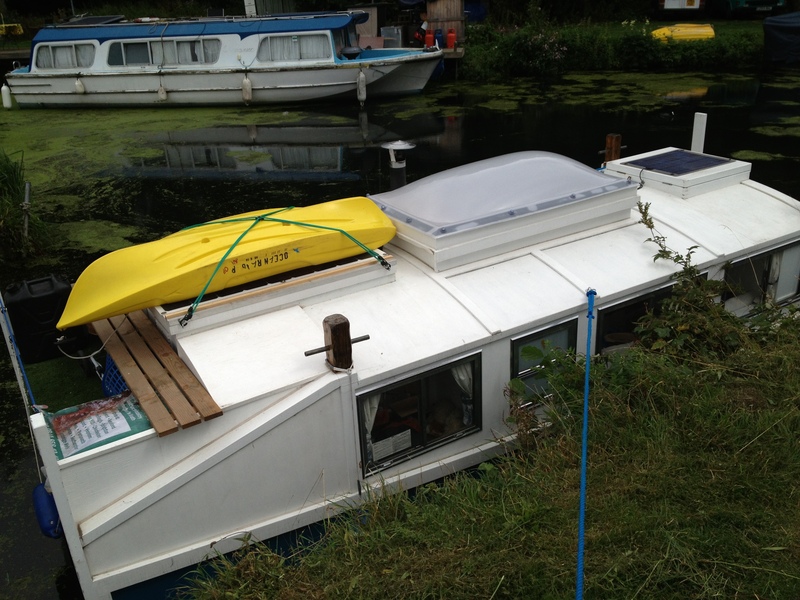 We got to the boat yard in Stanstead Abbotts about a quarter to eleven, as soon as we got there mum and dad sorted the boat out. At two o’clock we were launched. We all hopped aboard, it took a little while to turn around, once we had turned around we had to face the dreaded mill stream. This was the stretch of river which goes from the slipway to the main river. It took us four hours to do it. The rudder was caught up in all the weed so dad had to come up with another plan, we used the levering idea. Dad got a long pole and levered the boat along whilst I was at the back stopping the back bashing and mum was at the front stopping it crashing into other boats. For the last fifteen minutes some boaters helped us get out the mill stream. We then pedaled down the main the river to the pub and had a pint. I must admit that this first unexpected obstacle has been hard. We really had to dig deep and be determined. We all had to practice teamwork and problem solving. It was quite a good exercise for all of us, sort of a test to make sure we were ready for life on the river.